Mumbai: Sonny del Pilar tried for eight years to get work as a sailor so he could join the Philippines’ 8.7 million overseas workers, sending money to his brother’s family of nine rather than living with them in a Manila slum. 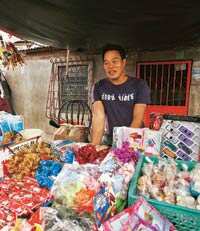 The 33-year-old gave up this year and set up a small shop in front of his house selling stuffed toys. He says competition from Indians, Bangladeshis and Syrians is making it harder for Filipinos to find jobs as seamen. “I work not just for myself but for my family and my siblings," del Pilar said in Manila. “I don’t know if I can still find work abroad. It depends on God’s will." The Philippines, which, for four decades has sent what the government called modern heroes to work overseas, is facing the first decline in remittances in eight years. A global recession is reducing job opportunities abroad just as a surge in cheaper labour from China, India and elsewhere ramps up competition. That’s threatening revenue that accounts for more than one-tenth of the Philippines’ $144 billion (around Rs7 trillion) economy. “Times are changing, and we are being overtaken little by little," said Victor Fernandez, president of the Manila-based Philippine Association of Service Exporters Inc.
China, Mexico, Bangladesh and Syria have all outpaced the Philippines in remittance growth in the past decade. India will be the biggest recipient of earnings from overseas workers this year, getting $30 billion. That’s almost twiceas much as the Philippines, according to World Bank estimates. Concern that fewer overseas jobs will exacerbate the 7% unemployment rate, second highest in the Asia-Pacific region after Indonesia, prompted President Gloria Arroyo in October to announce a massive retraining programme. She also created a 100 billion peso (around Rs9,820 crore, or $2 billion) human capital fund. “The Filipino is the most desired worker in the world and we want to keep it that way," said Augusto Boboy Syjuco, director general of the Technical Education and Skills Development Authority, or Tesda, which trains Filipinos to make them employable. “We have to prepare during a slowdown." A record 1.08 million Filipino workers went overseas last year, according to the Philippine Overseas Employment Administration. Still, three-quarters of the 305,554 who found work were nannies and maids—the largest category—as well as tailors, electricians and factory workers. Those low-skill jobs compete with cheaper labour from countries such as India. At risk is the nation’s largest source of foreign exchange after exports. Money sent home from abroad accounts for 11.6% of the Philippine economy, compared with 2.4% for India and 2.8% for Mexico, according to the World Bank. Still, the $201 that remittances provide for each Filipino far exceeds the $20 per Chinese and $26 per Indian this year, and the Philippine per capita remittance growth has exceeded that of those two countries and Mexico in the past five years. The Philippine economic growth may fall to an eight-year low of 3.5% in 2009,the International Monetary Fund said last month. Slow spending has already hurt profit at the nation’s banks, retailers and telephone companies. A decline in remittances represents a loss of income for the Philippines economy, said UBS AG economist Edward Teather in a 7 November note. Money sent home by Filipinos working overseas may drop 5% next year, he said. That can make a difference for Philippine families, whose average income in 2006 was 14,394 pesos per month. In contrast, a Filipino who works as a nurse in Canada can earn a minimum of $1,974 a month, according to the Philippine Overseas Employment Administration. The strategy of encouraging citizens to seek jobs overseas dates to the 1970s, when Philippine workers went to West Asian countries during the oil boom. In 1994, then-president Fidel Ramos created Tesda to upgrade the workforce. His administration also coined the term modern heroes to refer to those who support families at home. Tesda, which offers 185 courses including software development, bartending and underwater welding in its 125 schools and 4,567 partner institutions, received half of the government’s annual $100 million budget for labour last year and produced a record 1.7 million graduates. While the investment has paid off, the government’s salary regulations have also made Filipinos more expensive compared with workers from India and elsewhere. Most Filipinos seeking low-skilled jobs overseas rely on placement agencies that are required to comply with the Philippine government rules on minimum salaries. That means at least $250 a month for Filipinos working as construction labourers in Saudi Arabia, compared with as little as $110 a month acceptedby other nationalities, saidFernandez. “We have been sitting on our laurels for too long," said Fernandez, whose group includes more than 750 recruitment agencies. “The Philippines must improve its competitiveness by upgrading our skills and deregulating the salary offers and benefits to overseas workers." Cecille Derilo, who worked illegally as a paper cutter in Tokyo earning 150,000 yen ($1,600) a month three years ago, is taking that advice and going back to school. Derilo, 29, is learning how to weld carbon steel pipes at a Tesda training centre in Manila, helped by a government scholarship. “It is hard to get a job overseas unless you have a skill that companies are looking for," she said. “Everybody wants to go overseas so I have to study to be more competitive." Minh Bui in Tokyo contributed to this story.